The lightweight Octane Multi Plier multi-tool from the experts at Gerber packs a whole lot of functionality into a compact, portable frame. In addition to the tough pliers, it contains nine other utility tools including a knife, flathead and cross screwdrivers and a retail package opener. 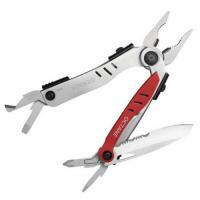 The sturdy pocket clip and one-handed opening mechanism make it extremely convenient and perfect for everyday carry. The low profile design weighs only five ounces and fits comfortably into a pocket. The Octane's satin-finished stainless steel is durable and wear-resistant.